Casa das Flores (AL25736) is perfectly situated in the centre of the sheltered, south-facing bowl of Arco da Calheta. Sleeps 6, an additional beds can be provided for children. Calheta has the reputation of being one of the warmest areas in Madeira. The villa was designed to maximise from the benefit of its position for its views of the Atlantic Ocean, Arco da Calheta village and the mountains behind. A top class interior designer was employed to assist with the interior layout and furnishings. The villa is positioned to maximise the shade in the summer to keep the villa cool and in the winter allow the sun to shine on the south facing windows. This contemporary, high-spec villa is surrounded by extensive, well maintained gardens, offering luxurious and spacious accommodation with uninterrupted 180º views of the Atlantic Ocean and village. The open plan living area is designed for maximize use of natural light and for indoor/outdoor living. The ample Miele-fitted kitchen/diner leads directly out to a large pool terrace with BBQ, outside dining table, loungers and umbrellas. The pool (11x4m), with its solar cover, is heated to maintain a water temp of approx. 22c, in the Winter, higher temperature in the summer. Additional heating up to 28c can be provided in the Winter, at an additional charge, please contact the owner for details. For winter, the lounge has a wood burner, the kitchen and bathrooms have under-floor heating and oil-filled radiators are available for the bedrooms. All windows are fitted with electrically operated shutters. WiFi, DVD, CD, games and sky satellite & meo cable TV are available, including Sky Sports 1,2,3,4 and Eurosport. Casa das Flores is licenced (AL - Alojamento Local- ) and tourist approved, complying with all statutory requirements, is registered for IVA and pays appropriate taxes, so you can rent with confidence. This Villa is ideal for indoor/outdoor living and you can enjoy meals outside during most of the year, except perhaps Jan-Mar. The winter sunsets over the ocean are a perfect evening backdrop. The large terrace, provides a number of private sun bathing areas, with attractive flower beds, extends along the length of the house and contains a large heated swimming pool, which measures 11 x 4 metres. The water is heated by using a solar cover and a modern heat pump (backed up with a tubular electric heater when requested). In summer the water temp is 27c minimum, winter water temp is approx 22c Additional winter heating for the pool can be ordered in advance, at an additional charge. Adjacent to the pool is a shower room and a BBQ shack (conveniently close to the kitchen) with gas BBQ, a 2-burner gas hob and sink unit. Plenty of garden furniture is provided, including a dining table for 6, numerous additional chairs, 6 sun loungers and 2 umbrellas. Awnings provide shelter over the dinning area. Stone steps lead up to the pretty, well-stocked landscaped garden at the upper level behind the house which can also be accessed from the bedroom passage. Plenty of satellite and cable TV channels are available including Sky Sports 1,2,3,4 and Eurosport and Meo cable TV. BBC and ITV programmes cannot be received via satellite in Madeira, computer plug in points are available on a TV. The lounge and kitchen have large 40 ins screens. There is a DVD/C player in the lounge and a CD player in the office area. Selection of DVDs, CDs,books, games, playing cards provided. WiFi is available for use. Funchal - 30 minutes by car. Local café/bar 5 minutes walk. Choice of restaurants 6 minutes by car. The Village can be reached by using local paths with direct access from the Villa. SUITABILITY...: Ideal for those looking for a stylish property in a stunning location with exceptional views - perfect to enjoy a relaxing or an energetic holiday. Children under 10 only by arrangement due to safety issues relating to the swimming pool. Also, no smoking or pets. Unsuitable for those with limited mobility. Whilst a taxi service is available, car hire is recommended for guests who wish to be mobile. The English-speaking caretaker lives nearby and is on hand if help is needed. We completed the construction of Casa das Flores in Feb 2008 to our own design. We enjoy travel, having travelled around the world we were looking for a base outside of the UK to add to our home in Wiltshire. We were looking for a sub tropical climate where we could entertain family and friends. We ended up with a short list of 2 areas - the Bay of Islands in New Zealand and Madeira both have similar climates. Madeira a 3.5 hour flight from London and most UK regional airports. with flights 7 days a week topped the checklist. With wine for as little as 2 euros a bottle, good food, wonderful views, flowers throughout the year and friendly people would be very difficult to beat for a relaxing holiday. Casa das Flores is situated in the sheltered bowl of Arco da Calheta. Calheta is west of Funchal. The area is renowned as being sheltered from the prevailing north easterly winds. The nearby village of Ponta da Sol is renowned for being the sunniest village on the Island. A quite area, all facilities within 4 kms. Shower rooms with walk-in showers and underfloor heating are available on the first and second floors. The master bedroom has an en-suite bathroom fitted with a bath which has a shower with sliding enclosure doors. Underfloor heating here too. An additional walk-in shower is adjacent to the swimming pool and barbecue area. There are numerous foot paths linked to the Villa. Calheta Beach has a medium size supermarket, restaurants and bars. The village of Arco da Calheta has a number of bars, small shops - fruite and vegitables, grocery, bakery, chemist and hardware, all within easy walking distance of the villa. Large garage with direct access to the Vila. Exercise bench with weights and cycle provided in garage for use an own risk. 2 electric ovens one with microwave. Full set of equipment to satisfy all grades of Chefs! Sky satellite box providing all sky channels including sky sports, but excluding BBC and ITV. Meo cable providing a wide range of European channels. HDMI cable supplied for computer attachment to TV. Heated to approximately 18/20c the Winter, higher in the summer - up to 28c. Fitted with solar cover . Heat pump and 18kw heater. Additional heating provide at a charge, contact the owner for details. My daughter Claire has helped me make sure that the kitchen and equipment was suitable for the cordon bleu chef. She is a Pru Leith trained chef and regularly checks the kitchen. Her next inspection will be on the 5th April when she joins us at Casa das Flores. We thoroughly enjoyed our week's stay (in March) at Casa das Flores, and have nothing but positive things to say about the house, location, or our interaction with Richard. The house was in great shape and has a good layout to catch the sun and views, and has lots of room. We found the Calheta area perfect because it was consistently sunnier than other parts of the island, but very easy to get to anywhere else in less than an hour by car, something important to us as we wanted to hike each day. There are some great hiking/walking options even within 15-20 minutes. We did pay a bit extra to have to pool heated to 27 degrees (instead of the normal 22 degrees in winter), and swam almost every day. We are Canadians, and while Madeira is really not very well known here (most people go down to the Caribbean in the winter), we found it to be an excellent vacation choice, especially since we wanted an active vacation instead of laying on a beach, sweating. Total travel time from Toronto, on Azores Airlines, via a connection in the Azores, was about 9 hours. We loved the comfortable springtime weather, amazing scenery, and all the hiking options. Thank you for your review. For the guest who wants to avoid the hustle and bustle of Funchal, Arco da Calheta is an ideal location. The Madeirans tell us that in the sheltered bowl it is warmer and sunnier than Funchal. We find the air is clean avoiding the fumes of the busy city. Calheta has easy access to most parts of the Island being only 25 minutes by car from Funchal. Excellent villa in a lovely location. Very comfortable - like living in your own home. The villa was excellently equipped, with a great sized pool and in a great location. We will be returning !!! We enjoyed our stay at the Villa very much. The Villa itself was very good and the local management people were also helpful and courteous. The location and views from the Villa were spectacular. This was our first visit to Madeira and we hope it won't be the last. I would recommend this property to anyone. Casa das Flores was designed so that its position maximised the benefits of the sun both in the summer and winter. All of the rooms have the spectacular views. Fantastic - you won’t want to leave. We cannot recommend this property enough. Our stay was perfect. The villa was designed so well, it was so lovely to experience living in it. It was very spacious and had so many different aspects of it. The town is quiet and the view is amazing. Not much to do in the town, so we focused on enjoying the villa and cooking. No beach near by. There is some hiking about 30 mins drive. You do need to rent a car and there are a lot of hills so be careful not to overheat your brakes. We did. Also, the hot water did not work on our last day, but the housekeeper sent over maintenance right away. Otherwise, highly recommended stay! Thank you Lillian for your review. 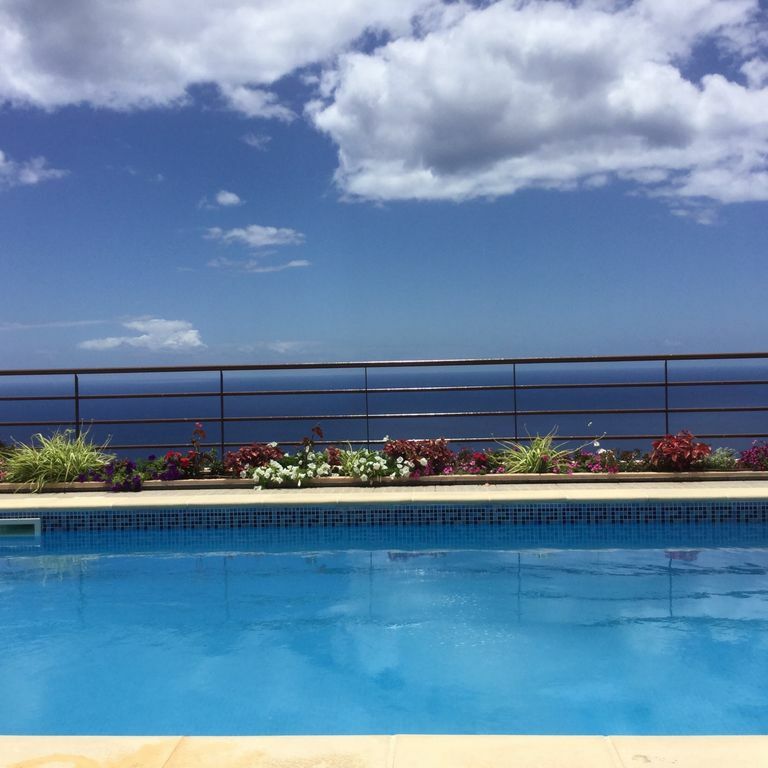 Casa das Flores is in the Village of Arco da Calheta, which is in the ‘ county’ of Calheta. The village has a number of small shops and bars which provide supplies for day to day requirements. Calheta Ville is 5 mins by car where there is a supermarket, a number of restaurants by the Marina and 2 man made sandy beaches with sand imported from Morocco. There are a number of walks around the village on the veradas, a path up the steep Verdai leads to the top with spectacular views. If you continue up to the top of the valley you reach the levada, a 2 hour hike west will take you to Prazarus. A 15 min car ride to Jardine da Mar or to Paul da Sarra provide the opportunity for coastal or in land hikes. The perfect holiday destination. Situated 260 metres above sea level with 180* views of the ocean and surrounding hills. The villa is below the banna line and avoids the dampness and cold of higher locations. The villa is accessed by its own private road amongst banana plantations and small holdings, Casa das Flores with its 11 mt tested pool and large private terraces and landscaped gardens, sits on a terrace in the pretty, rural village of Calheta well away from the bustle of Funchal. Thanks to the new road system anywhere on the island is now within easy reach and some of the island's top attractions are only a short drive away. Within 5 minutes' drive you reach Calheta with its beach of golden sand, a large marina offering dolphin/whale watching excursions and deep sea fishing boats for charter, a hotel, supermarket, art gallery and good choice of restaurants; or 15 minutes will bring you to the laurel, levada and waterfall wonderland of Rabaçal and the wide open expanses of the Paul da Serra - fantastic walking terrain. Car hire is necessary to enjoy all that this area has to offer and to explore the beautiful sub tropical island of Madeira. We have had a number of guests who opted to use taxies who have had a very enjoyable, relaxing holiday. Walks; numerous walks of all grades in the area. Golf: The owners are members at Palheiro golf, a reduced green fee can be obtained for guests. My rental rates take account of the booking fee charged to guests booking through the website. Direct bookings, (no fee) are accepted, with transfers, in either sterling or euros. Sterling to a UK bank, € to a Portuguese bank.No fee is charged. The above rates for for 2 guests. . Sorry, no children under 10 years of age, unless parents accept that children are controlled all of the time, due to safety issues relating to the swimming pool and the stairways. Arrivals welcome any day of the week. Included: fresh linen, towels and pool towels, weekly linen and towels change. The swimming pool temperature is approximately 22c in the Winter ( October to May) and up to 28c in the summer. Additional heating can be provide at an additional fee, please contact the owner for details. Cancellation Policy. Full refund for cancellations 60 days before arrival date.